All Cabinet ministerial portfolios will be filled before November 14 and the relevant gazette notification will be issued, Co-Cabinet Spokesman and Ports and Shipping Minister Mahinda Samarasinghe said. Seating arrangements in Parliament will be done according to this gazette notification. 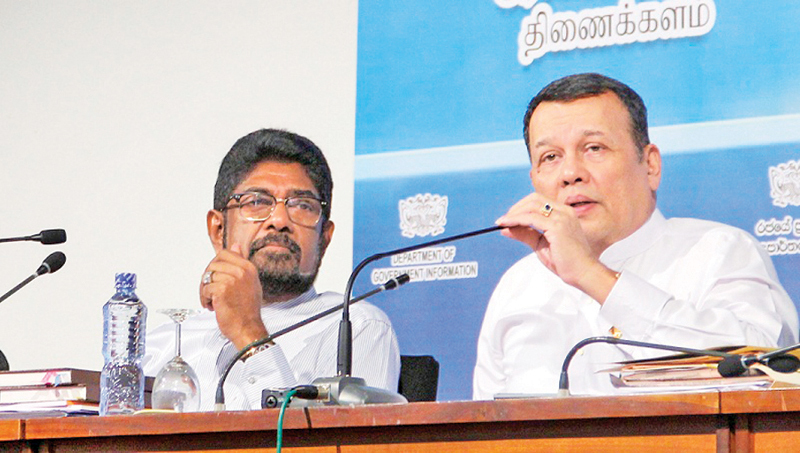 Everything will be done according to the Constitution, Parliament traditions and existing laws of the country, Samarasinghe told the weekly Cabinet press briefing held at the Government Information Department Auditorium in Colombo yesterday. He said that the Chief Organiser will be named soon. Parliament will be convened and the President’s proclamation will be read. May be the policy statement will also be made. Then Parliament will be adjourned. Samarasinghe said if a no confidence motion was handed over to the Parliament Secretary General with the required signatures, it will be put into the Order Book. Then it will be taken up during the Party Leaders’ meeting. Then a date will be fixed. Then it will be included in the order paper. Then it will be debated. Then it will be subjected to a vote. A date will be given as early as possible. This is very clearly mentioned in the Standing Orders.There is no confusion whatsoever. Minister Samarasinghe said the Speaker should act according to the Constitution, Parliament traditions and the law of the country without being biased. Offering a Cabinet portfolio is not bribing someone. It is appointing a suitable person to a suitable position. Anybody can talk about this with anyone. Former Minister S.B. Dissanayake did not mention ‘money’ during his telephone conversation with UNP MP Range Bandara. He did not mention about cash, he said. Co-Cabinet Spokesman and Mass Media and Digital Infrastructure State Minister Keheliya Rambukwella thanked British Parliamentarian Lord Naseby for being not biased and taking a balanced stand.